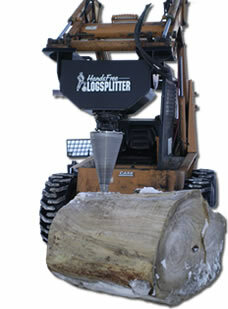 We currently offer the Rotational Log Splitter that mounts on a skid steer or excavator. Break down those big logs from the comfort & safety of your skid steer or excavator cab. Available in 3 sizes, we have a splitter for most any size job or any size log. In addition to a log splitter, there are attachments that convert the machine into a cement mixer, stump grinder, auger & PTO adapter. These log splitters are built tough and are made in the USA. Keep an eye on this page, more log splitters coming soon. 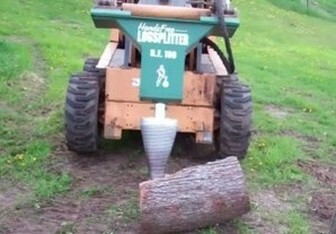 Mount the Rotational Log Splitter on your skid steer or excavator & easily split even the biggest logs. Used in conjunction with a firewood processor, this Log Splitter allows you to break down those big logs to a manageable size to run though a firewood processor. This skid steer Log Splitter is basically a large cone-shaped screw that burrows into a log or stump, and can "crack" open most any type of wood. For more information on these awesome log splitters, contact us or give us a call at 218-206-2066.